If you’re up for a challenge, this half marathon is described as the most challenging half in the state of North Carolina. It heads to the top of Morrow Mountain and back to Badin. The 10k and 5k are out and back courses. Run the Valley is organized by the Uwharrie Running Club. Proceeds benefit the COMMUNITY CARE CENTER. The Run the Valley Half Marathon is back for the eleventh year for you to tackle. Deemed the most challenging half marathon in the state of North Carolina, the course will take you to the top of Morrow Mountain and back to Badin. 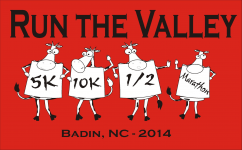 2015 marks the 18th Annual Run the Valley 10K. This out and back course offers rolling hills and beautiful rural scenery. The course begins at the Badin Post Office on the corner of Falls Road and Boyden Street. Runners follow Boyden Street to Valley Drive and run to Morrow Mountain Road where a left turn takes runners toward Morrow Mountain State Park with the turnaround at the Baptist Church and back to Badin. For the fifteenth year, you may also choose to run or walk this fitness 5K and enjoy the rural landscape. This course follows the same route as the 10K with the turnaround marked on Valley Drive.